'The Creeks', the Albert Herter estate designed by Grosvenor Atterbury c. 1899 in East Hampton. Click HERE for more on 'The Creeks' and HERE to see 'The Creeks' on google earth. 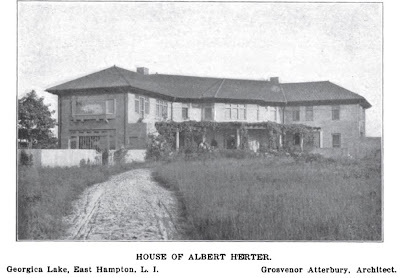 Photo from Architectural Record, 1905. Decorated by Peter Marino for Ron Perelman in a much-publicized whirlwind, I doubt that there is much of the original aesthetics left. But it was a fabulous property with a long, artistic history. I liked the contemporary sculpture strewn across the grounds, all that could be seen of the estate from the road in the 1980s. not to belabor a point but how is mr. b (for bs) going to make any money on the deal. 17 1/2 mill plus 4500 a day for 7 years plus taxes for 7 years equals about 32 mill. now he's got to create roads, permits, landscaping, and build 5 - 10 mill houses on spec. if he sells them all, what's left over - not much. security word def - "tocab" - what mr b will need to get out of dodge when peegate falls apart. one won't be enough. I like the comparison of this 1905 photo with a sand? road up to the front door versus the concrete? drive there today (Bing views). Likewise, gardens right outside the front & back doors have been replaced with hard surfaces today. But the house has been remarkably left alone (on the exterior at least) even though subsequent owners have added some sizeable structures nearby. A friend took me here in the seventies when the Ossorios were still going full steam---it was eye-popping, the wild art, the purple and black color scheme, etc. PS, Lil Gay Boy, pls. remind Old Gay Man how to do links within comments? Like Elsie de Wolfe said, 'sauitability, suitability, suitability'...there's a time to be grand, and there's a time to keep it tamped down. But that remark was aimed against wood siding. Sumbitch'll clad his new development in tabby or stucco. Some kind of masonry. Cheesiest grade available slathered onto the flimsiest base on the market. He'll offer no warranty. No one will ever know since he's probably already bought the building inspectors in order to get his variances. The leaks won't spring for at least two years, so since he's got pre-sale contracts already lined up before he even starts construction, he's safe on that front. Same old, same old.